One of the best sources for helping you plan and select plants for your landscaping project is a local nurseryman. They have years of experience working with the specific climatic and soil conditions we face in coastal South Texas. 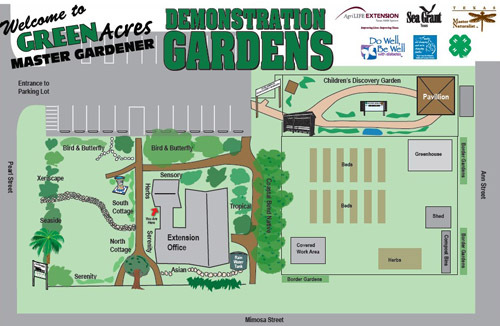 You can also get more good ideas by visiting Green Acres, the demonstration gardens designed and maintained by the Aransas/San Patricio Master Gardener volunteers. It is located at 611 East Mimosa in Rockport. This site is particularly valuable to homeowners ready to design or refurbish a landscape on the Live Oak Peninsula stretching from Fulton to Ingleside Point. Another source of landscaping ideas is the South Texas Botanical Gardens & Nature Center located on Oso Creek. It includes several demonstration gardens and natural areas. Nueces County Master Gardener volunteers help maintain a hibiscus garden, an arid garden, a hummingbird garden, a plumaria garden, a rose garden and other exhibits. The Texas AgriLife Extension Service offers landscaping classes that can help you come up with a plan that meets your family's needs and suits your fancy. Your goals should include organizing your property for maximum use and enjoyment, creating a visual relationship between the house and yard, and reducing landscape maintenance requirements. Creating a plot plan on paper is important because it forces you to think about factors like sun exposure, wind direction, areas where shade is needed, drainage, access, irrigation and neighboring properties. FUN WITH SOIL - A good soil is one that supports healthy plant life and conserves moisture, has a balance of rather course soil clusters, sand and pore spaces. Experts say the "ideal" soil has as much as 50% by volume pore space with the soil itself consisting of a good balance of sand, silt and clay particles. Much of the soil west of Ingleside is heavy clay soil. Clay is composed of microscopic crystals arranged in flat plates. When a soil has a high number of these crystals they act much like a glue, cementing the particles of sand and silt together and resulting in a compact, almost air free soil structure. Plants in clay soil, even though it is moist, often struggle. Plant roots need air to thrive. In clay soils the air spaces are small and may fill with water. Plant roots often suffer from oxygen starvation. You can grow happy plants in heavy clay soil but you have to so some work first. Adding a large amount of organic material such as compost and working it into the soil to a depth of about a foot. The soil structure will keep improving over time as microorganisms in the soil work to break down all of the organic material you've added. You'll need to add more organic material to the garden every year. Gardeners with a lot of sand face different challenges. Sandy soils have very large pore spaces. Because the particles are large, there is little surface area to hold water, so sandy soils tend to lose water rapidly. At the same time it allows nutrients to flow easily to your plants' roots. The Master Gardeners recommend you use compost on sandy soil to help retain water and provide nutrients. For a complete compost recipe and all the help you need to make your own, visit the AgriLife Extension office. The Gardeners also suggest you use a mulching mower and leave the grass clippings on the lawn to provide free fertilizer. Master Gardeners stress that you should get your soil tested to determine what nutrients to add to your lawn and landscape plants. SAVE THE NATIVES - If you have a site that has previously undisturbed native plants you have some additional options. These plants are, by definition, perfectly adapted to the area. In rainy years they flourish; in dry ones they survive without supplemental water. On Live Oak Peninsula there is a healthy diversity of native trees and understory. The Master Gardeners warn you not to change the soil level around existing trees - all the way to the edge of the canopy. They suggest that you tidy up rather than remove plants that grow under existing native trees. This will eliminate the difficult task of trying to establish groundcover plants in dry shade. Native understory plants require little or no maintenance and seldom need supplemental water. These plants also provide food and habitat for desirable birds and butterflies. WINDY REALITY - A major feature of our climate is the prevailing southeast wind. It routinely blows over 20 mph during the spring growing season. It means that newly planted shrubs and trees must be staked unless they are planted in a protected location. Constant wind plus high temperatures can kill new plants in a hurry. Every landscape plan needs to factor in the wind. Green Acres, an award winning demonstration garden, surround the Texas AgriLife Extension Service - Aransas County Office, located at 611 E. Mimosa, Rockport, Texas.The gardens showcase plants and landscape schemes suitable for the Texas Coastal Bend. The gardens are open during daylight hours - seven days a week. Explore the gardens and take a self-guided tour. A guided tour with a Master Gardener can be arranged by calling 361-790-0103, or email aransas-tx@tamu.edu, 2 weeks in advance. 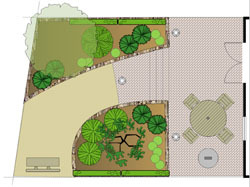 You can learn more about water-wise gardening at the Master Gardener website .